What is now becoming an annual tradition, the 46th anniversary of the first hang gliding worldwide meet, May 23, 1971, will be held at Dockweiler Beach, CA on Sunday May 21, 2017 from 11:00am to sunset. This also happens to be our regular Sunday Funday since it is the 3rd Sunday in May. As in the past, US Hawks and FDGS will share the cost of renting the Windsports school for the entire day so that pilots who have not maintained their USHPA membership over the years can fly a Windsports WW Condor under supervision of the school and thus be covered by the school's insurance. Pilots with current USHPA insurance coverage can sign the register with their current hang rating shown. Their is a county beach parking fee and a $5 HG site use fee. Please pass the word along to hang glider folks you have contact with. Many of those who have attended the 44th and 45th anniversary meets have expressed the fun they had (it's like the early days says this old timer) and said they hoped it would become an annual event. Those who still have a relic HG from the past bring it out to fly or just show. I'll leave my Eipper FlexiFloater home this time (been there past 2 times) to give someone else room to set up their old glider. County rules do not allow paragliding at this site. Thanks for keeping this going Frank!!! I copied your post to the Sylmar forum. 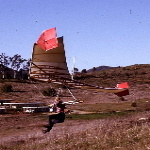 It would be good to copy it to other forums ... Crestline, Funston, OzReport, HangGliding.org. This is a reminder that the 46th anniversary Otto Lilienthal hang gliding meet is coming up soon – on Sunday May 21st. I have made some changes to clarify how HG pilots can fly and what we will be providing through the Windsports HG flight school for attendee’s guests. So, if you’ve read it before, please read it again. What is now becoming an annual tradition, the 46th anniversary of the first hang gliding worldwide meet, May 23, 1971, will be held at Dockweiler Beach, CA on Sunday May 21, 2017 from 10:00am to sunset. As in the past, US Hawks and FDGS will share the cost of lessons at the Windsports Flight School for the day so that pilots who have guests with them, who have never flown a hang glider before, can get a training flight with an instructor’s assistance (for free). Vintage pilots, who have not maintained their USHPA membership over the years, can fly by becoming a 30 day USHPA member (Windsports & FDGS will pick up the charge for that) and thus they will be covered by the school's USHPA insurance. Pilots with current USHPA insurance coverage can fly by signing the Windsports register, with their current hang rating shown. There is a county beach parking fee and for flying there is a $5 site use fee. All of the non-flying activities of the event will be covered by an event liability insurance policy, as required by our LA County, Department of Beaches & Harbors, one day event permit (yes, we’re totally “by the book” this year!). County rules do not allow paragliding or RC flying at this site. I'm writing to remind everyone that the US Hawks, the Friends of Dockweiler, and Windsports will again be hosting the annual Otto Lilienthal Hang Gliding Celebration at Dockweiler Beach. This year's event will be this Sunday, May 21st, and everyone is welcome. As in past years, all flying fees are paid in advance, so all you have to do is show up and fly (you will have to pay your own parking fee and follow normal site rules). As before, Windsports will be providing first day introduction flights (again for free) for anyone who wants to get their feet in the air. Please feel free to invite family and friends who might want to try it out. Thanks again for your membership in the US Hawks! !